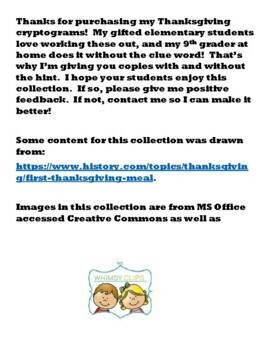 This is a collection of cryptograms, both with and without clue words, with information about the first Thanksgiving, and what the pilgrims and Wampanoag ate for dinner. It was designed for use with my elementary Gifted students, but my 9th grade son also enjoys it! This is the first in a series I have planned. 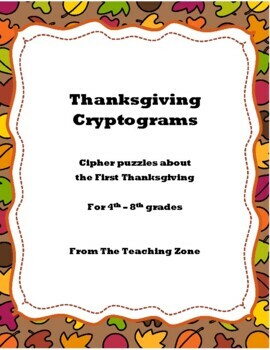 It includes 3 cryptograms, each with a copy including a clue word, and clueless copy, as well as an answer key. If you purchase my product, please leave feedback so I can continue to improve! Thanks! !